Build a beehive, collect nectar, and make honey while also being efficient, being strategic, and outmaneuvering your opponents! In Waggle Dance, a Euro-style worker-placement dice game for 2-4, players control worker bees to build their hive, produce more bees, collect nectar, return it to the hive and make honey! 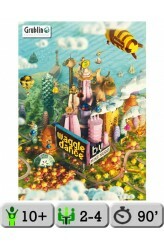 (What is a "waggle dance" you ask? It's a series of patterned movements performed by a scouting bee to tell other bees in the colony the direction and distance of a food source or hive site. Players need to organize their bees to make as much honey as possible to see the hive through the coming winter. The winner is the first player to successfully create 7 or more honey tokens in their hive. It's up to you how to achieve this: Do you focus on nectar collection, increa..